It’s hard to deny that the world loves a good pair of ballet pumps. Versatile, comfortable and fashionable… what’s not to love? A must-have for any woman or girl’s shoe collection, a nice pair of ballet pumps (often referred to as dolly shoes or ballerina flats) can be dressed up or down easily depending on the occasion. The design possibilities are endless too, making them the perfect footwear when you want to make a statement or if you’d prefer to keep things low-key, simple and clean lines can work equally well when it comes to ballet shoes. Taking direct inspiration and their name from the modern variation of the popular dance shoes worn by ballerinas since their conception in the 18th century, ballet pumps offer a feminine and delicate look to an outfit without the need for heels or thick soles. 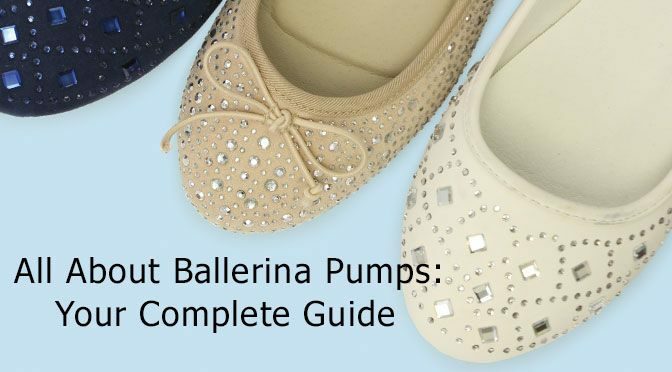 We’re going to take a look at what ballet pumps are all about, how best to style them and how to take care of your ballet shoes to keep them looking good. Ballet pumps are round toed shoes which are usually lightweight and look similar to the shoes worn by ballet dancers. As we mentioned before, dolly shoes take direct inspiration from the footwear of ballet dancers and popularised in the 1950’s by the likes of Audrey Hepburn, Marilyn Monroe and Elizabeth Taylor to name a few. Often they are made using a single piece of soft, supple leather for the upper and insole with a thin vulcanised rubber sole with a slight heel for added durability and comfort. Though, other popular materials are used to make them, such as canvas, PVC and nylon. Sometimes they’re also made with a hard polyurethane compound, perfect for those that want something a little more hard wearing. The term “unstructured” can often be used to describe ballet flats as they don’t have a heel cap or cuffs around the ankle area, because of this they have a more relaxed feel and are also less likely to rub when first worn. You may, however, find that formal ballet shoes are a little more structured and often have a hard sole with a low heel. Some ballerina pumps come with an ankle strap, wrap around laces or a t-bar as a design feature, adding a new dimension to the shoes and giving you a different style of footwear to work with. With so many different styles of ballet shoes out there, you’d be completely forgiven for a owning a few pairs, in fact, we highly recommend it! Because ballet pumps are so versatile, you can wear them with pretty much anything, whether you’re planning to take a wander round the shops in your favourite jeans, or you fancy a comfortable alternative to heels with your office attire. 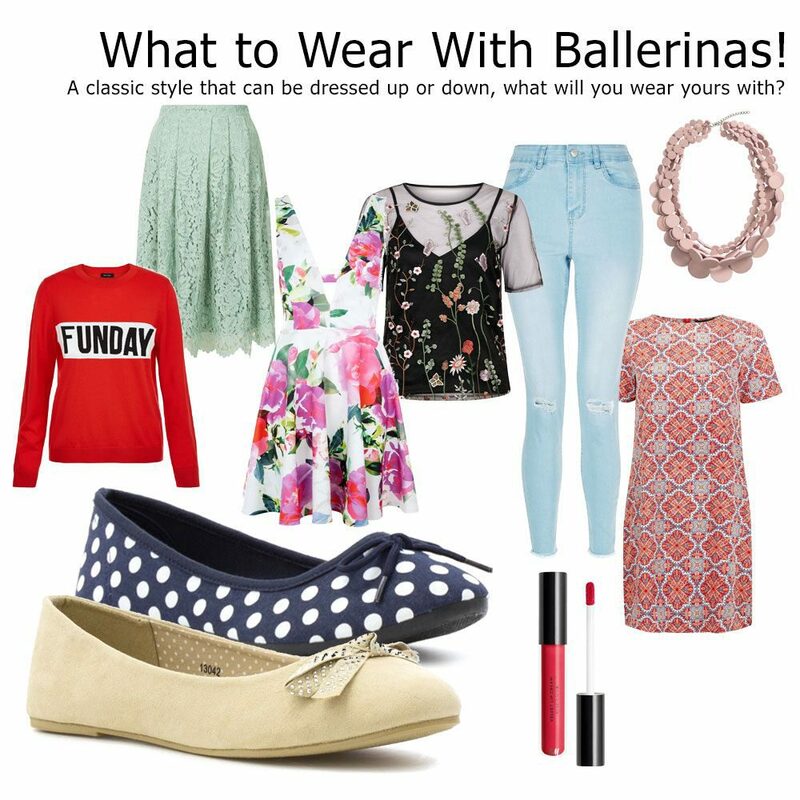 As well as jeans and office wear, ballet pumps also look great with leggings, skirts and dresses. If you want to channel your inner silver screen siren, team them with a lush pair of high waisted midi length tailored trousers for a truly vintage look. One option for summer would be open toe ballet pumps, not only do they allow you to create a different look – blurring the lines between sandals and pumps – they also give you a chance to show off your freshly manicured tootsies! If you’re planning to wear ballet flats during the winter months, there are a few things to consider; a harder sole with grip can be more beneficial whilst out and about as they can offer more traction in icy conditions. You should also try to avoid opting for ballet shoes that are made from a non-waterproof material such as canvas or suede as these will lead to damp feet which are the last thing needed when it’s cold. Choosing a waterproof material such as leather or PVC instead will help to protect your feet from the elements. During winter, you may want to consider wearing socks with ballet pumps and whilst this may not be something you’d usually go for, it can be a real style statement. One hot look right now is short ankle socks with a cute pair of t-bar ballet pumps, these can then be teamed with a knee-length skirt or dress and can look great dressed up or down. If you’d like to wear socks with ballet shoes but you’re planning to wear trousers, the best option would be a plain pair in a neutral colour such as black. Like any footwear, ballet shoes can start to look a little worse for wear over time, so what can you do to keep them looking good as new? Your first thought might be to just throw them in the washing machine, but we would advise against doing this as it could deform the shoe, some ballet pumps may also have layers of cardboard within the insole so getting these wet could damage them permanently. The best thing to do would be to use a soft brush to remove any obvious signs of dirt, then depending on the type of material the shoes are made from, use a damp cloth to fully clean the shoes. If your ballet shoes are made from suede, avoid using water on them at all, this will likely stain the shoes. Using just a soft brush should be enough to bring them back to their best. Using a protection spray once cleaned will also act as a preventative going forward, reducing the need for constant brushing. Using a protection spray would also help maintain canvas pumps. If you need to clean ballet shoes prior to using the protection spray, we would recommend making a paste using washing powder and bicarbonate of soda which can then be worked into the shoes, once that pumps are clean, use a moderately damp cloth to remove any excess. You should then leave them to dry for at least 24 hours before wearing them. If you have patent or leather ballet shoes, you could also use a suitable shoe polish to help protect them, don’t forget to make sure you get the right colour for your shoes! If like many you mainly wear your ballerina’s without socks, it’s not unusual for them to start smelling over time, this is due to the buildup of bacteria caused by sweating but there are a couple of things you can do to help with this. We would always recommend alternating the footwear you choose on a day to day basis, this will help prevent bacteria build-up and will also allow them to fully dry out between each wear. A talcum powder and bicarbonate of soda mix can also help to absorb any dampness as well as deodorise your ballet pumps. If you’ve been caught short in wet weather, it’s likely that your shoes will get wet. When drying shoes, we would always suggest keeping shoes away from a heat source. Even though sticking them on or near a radiator may seem like the easiest thing to do, it can cause your shoes to deform or discolour as it dries. Using scrunched up newspapers are extremely effective at soaking up any excess moisture. It’s easy to get blindsided by a beautiful pair of ballet flats, but it’s important to make sure they’re right for you. As well as considering the right size, it’s important to make sure you have the right fit too. If you have a wider foot always make sure you choose a width that isn’t going to cause you problems, shoes that are too tight can cause corns and bunions over time so getting it right is imperative for healthy feet, tight shoes will also make your feet sweat more as they have less room to breathe, causing greater bacteria build up. On the flip side, ballet shoes that are too wide will offer little support and could be a potential trip hazard as your feet will likely move around when you walk. If your plan is to be on your feet for extended periods of time at work or you do a lot of walking, always opt for a pair of ballet flats that have a thicker, more substantial sole and a proper insole that supports the arches of the feet, they’ll definitely thank you for it at the end of a busy day! If you’re looking for a pair of ballet pumps to keep in your handbag, look for a pair that is soft, flexible and will easily flatten. Fabrics such as satin or soft leather are perfect for this, they’ll also be a better option for tired feet. Avoid ballet pumps with a rigid upper as they’ll likely take up more space in your bag than needed. Ballet flats have become an essential part of most women’s wardrobes over the years and it’s unlikely we’ll see their popularity decrease anytime soon. If you’re unsure what to team them with or how to keep them looking good, using our handy guide will certainly set your feet on the road to footwear heaven in no time! Lovely article with a lot of info….